Stencil is a Multipurpose HTML 5 Template for Bloggers, Freelancers & shop. Anyone who needs pixel perfect professional designs online can use this template as a base for their website built. It’s fully responsive and work well on phones. Specially crafted for portfolio, blogging & shop businesses by keeping in mind of mobile world. It’s easy to edit, whoever have basic knowledge of HTML/CSS/JS can easily edit. Note: All the images are display only, not included in the main download package. All images are just used for Preview Purpose Only. They are not part of the templates and NOT included in the final purchase files. We keeping main logo for showcase purpose only. That is not editable and need to replace with your own logo and name. 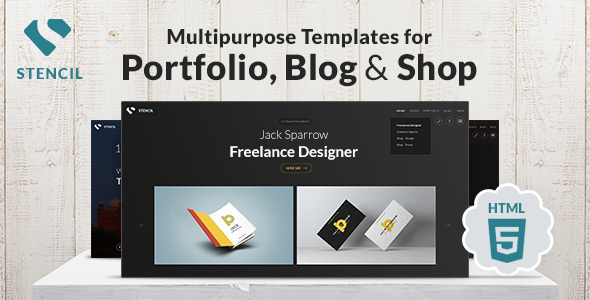 Thanks for showing interest in Multipurpose Portfolio, Blogging & Shop Templates. Should you have any additional questions, doubts or need support, please contact us via Envato profile. Also feel free to suggest new pages that you think we need to add in our next release.